MANILA, Philippines – The Court of Appeals (CA) defended its use of online sources, particularly Wikipedia, in relation to its ruling on one of the worst mining disasters in the Philippines. The CA cited information available on the Internet in its June 2015 decision which rejected Marcopper Mining Corporation's claim that the Regional Trial Court Branch 38 of Boac, Marinduque committed grave abuse of discretion by not dismissing the complaint filed by the Calancan Bay Fisherfolk Federation. The fisherfolk group said that the mine tailings that leaked into Calancan Bay in 1996 "adversely affected their livelihood and led to sickness – or worst, death – in nearby communities." 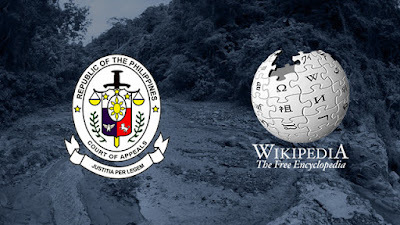 The CA explained that the use of Wikipedia and other Internet sources was needed as it had to study the concepts related to the case – such as why the mining pit collapsed and how it affected villagers – to resolve the petition "in a fair and just manner." It added that the Supreme Court, in several of its rulings since 2004, has cited the free online encyclopedia. "Resort to the Internet was made to supplant the missing information that will provide a sufficient background to apprise the Court of the basis and reason for the tort case filed by the fishermen," the CA said. The appellate court further dismissed Marcopper's argument that the ruling was of "unsubstantiated conclusion of facts." The 2015 decision of the CA's Fifth Division to uphold the 2013 ruling of Marinduque RTC Branch 38 was a welcome progress in the case which spanned almost 16 years. According to the CA, denying Marcopper's motion to dismiss the case was no grave abuse of discretion as the leaked mine tailings "caused an environmental disaster." The court noted that complaints against Marcopper even included the names of those who died or developed diseases due to the incident.